CATANIA, Italy (Reuters) – Lucky Iz had just turned 15 when he and his friend Godfrey set off to cross the Sahara on a hot August afternoon in 2012. Lucky has still not told Godfrey’s family what happened on the journey towards Europe. This is his account. The Nigerian boys arrived at the edge of the Sahara with water, biscuits, milk and energy drinks, just as the people-smuggler had instructed them, Lucky recalled. 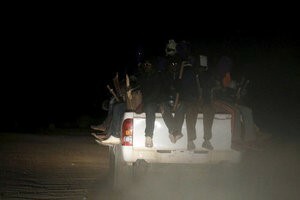 They climbed with 36 others onto the back of a Toyota pickup truck that sped away from Agadez, a city in northern Niger. Lucky sat atop a pile of supplies, hanging onto a post with his feet dangling over the side. He knew the driver would not stop if anyone fell off. He was parched and hungry. The sand that sprayed up from under the truck’s tyres stung his eyes. For three days they drove, stopping occasionally to refuel and drink their water. On the fourth day, the driver lost his way. His compass had stopped working. Some in the group would never make it out of the desert. International groups track numbers of migrants who drown crossing the Mediterranean to Europe. Last year an estimated 3,800 people died that way. But no one counts the dead of the Sahara. This makes it easier for politicians to ignore the lives lost there, humanitarian workers say. The United Nations refugee agency has no data on how many people die in the desert, according to its North Africa unit. The International Committee of the Red Cross reconnects families, but does not collect information about their dead. A handful of unofficial databases maintained by volunteers, academics and non-governmental organisations have tried to keep count, but they depend largely on media reports, and their funding is sporadic. 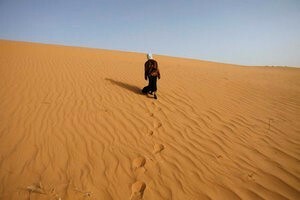 “We don’t have any data,” said Julien Brachet, a fellow at Oxford’s International Migration Institute who has been doing field work in the Sahara, including northern Niger, for more than a decade. Agadez has long been a gateway to the desert. The International Organization for Migration (IOM) estimates that 120,000 migrants passed through the city on their way to North Africa or Europe in 2015, more than twice as many as the previous year. In the past, people would leave the city openly. Weekly military convoys offered some protection. But since a tragedy in 2013, when 92 desert travellers died of thirst, the government has moved to shut down the routes, and the traffic has become more secretive and hidden. Lost in the sands, the driver of Lucky’s truck kept going for five more days, hoping to reach a landmark and reorient himself. By then, Lucky said, all the food and water was gone. Exhausted passengers began to fall off the truck at night. The driver did not stop for them. “The next day, we see ourselves, and we count ourselves and some people are not there anymore,” said Lucky, now 18, who after arriving in Europe lived for a year in a young people’s refuge in Catania, Italy. A day later, the vehicle ran out of fuel. Helpless, the travellers milled about. That afternoon, a sandstorm barrelled towards them. “We were just standing, looking. We don’t even know where to go,” said Lucky. “We don’t even know how we can go out from the desert. So many people died on that spot. “My friend fell down and died,” Lucky said. Everyone was crying. “We didn’t know who was going to die next. We don’t know who is going to give up next. So what do you do? The whole place was sand, so we had to dig out the sand with our hands and we buried him. The Sahara in northern Niger and neighbouring Mali is home to drugs and arms traffickers, people-smugglers, kidnappers and armed Islamist militant groups, some of them linked to al Qaeda. The European Union has put Niger and other countries under pressure to crack down on smuggling. In 2014, the EU opened a mission in Niger to train the security forces to “help prevent irregular migration.” Last year, Niger passed a law banning people-smuggling that could see smugglers jailed for up to 30 years. But Brachet says that may have been counter-productive because it pushed much of the trade underground. An EU official said it is a priority to tackle people-smugglers and others who put the lives of vulnerable migrants at risk: The bloc does not control borders or patrol in the desert, but supports the authorities with training and advice. The IOM, which has staff in northern Niger, is trying to gather better information about how many people move through the region, and what happens to them. It estimates that some 2,300 people pass through Agadez each week. But it recorded only 37 deaths in the Sahara in 2015. Last March, IOM staff visited Seguidine, a small village in Niger close to the Libyan border. In one day they found 85 migrants stranded, waiting under trees, abandoned by smugglers, said Giuseppe Loprete, head of the group’s mission in Niger. The government of Niger did not respond to requests for comment. Lucky said he and the other survivors walked for about 10 hours before they ran into a pickup truck on its way back to Agadez. They pleaded with the driver to take them the rest of the way. He drove them to Sabha in Libya and sold them to militants who forced Lucky to work for free. It would be months before he could escape and make his way to Italy. They left behind four men and two women in the sand – six more deaths that were never recorded.